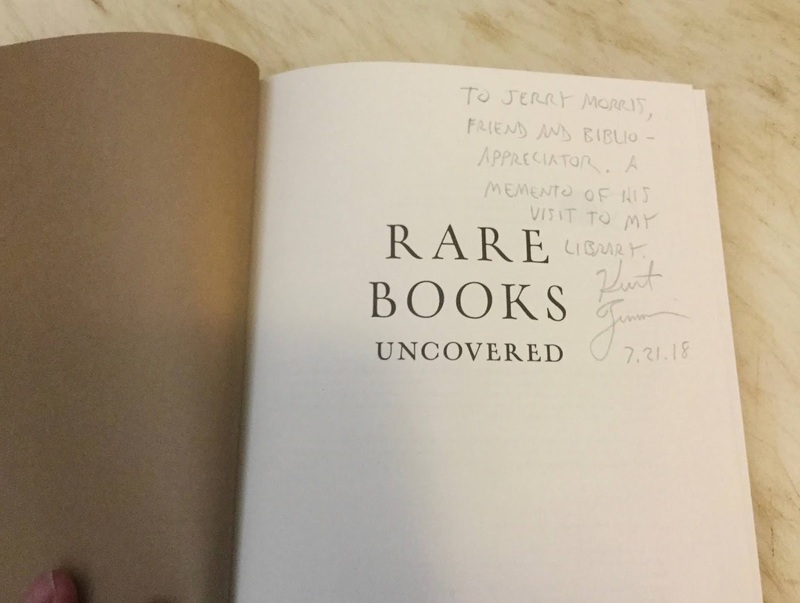 In days of old when nights were cold, authors of books about American Book Collecting would sit in their libraries and warm their hearts by inscribing copies of their books to their friends, many of whom were book collectors themselves. 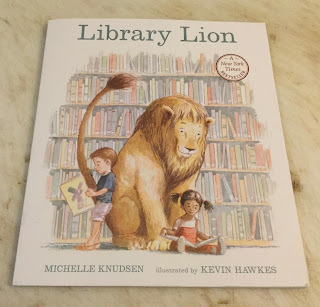 I had the pleasure––and the astonishment––of seeing many of these books when I visited the library of Kurt Zimmerman this past month. My wife Linda and I visited our son Todd and his family in Copperas Cove, Texas this past month. Counting my wife and I, there were fourteen family members present, four generations of Morrisses in all. Now Copperas Cove is near Fort Hood, about 200 miles northwest of Houston. And we usually either drive thru or around Houston to get there. But my wife wanted to avoid Houston altogether on the trip home because of the traffic. My wife and my son were looking at a map and searching for alternate routes when one of them mentioned driving thru Conroe, Texas. My ears perked up! "Did you say Conroe? I have a friend who lives in Conroe! Kurt Zimmerman!" And that's how my visit to Kurt Zimmerman's library came about. 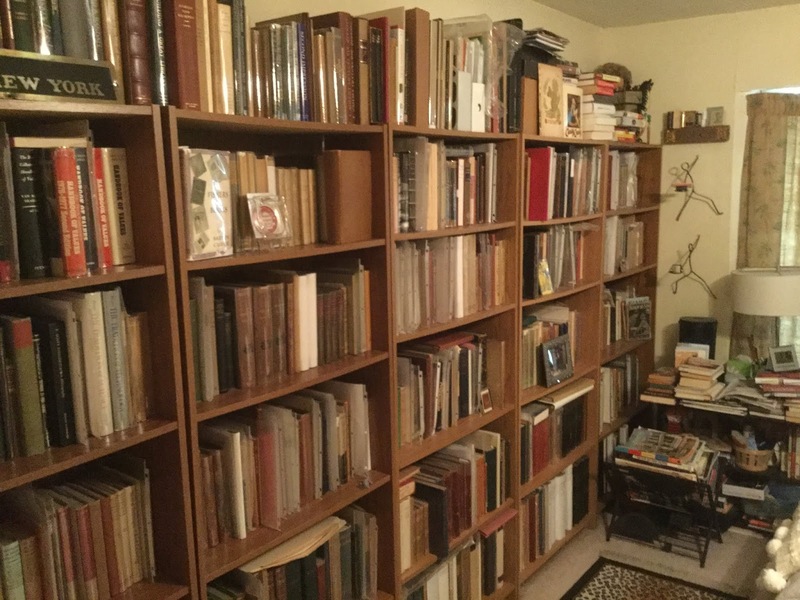 In 1914 the De Vinne Press privately printed A Sentimental Library: Comprising Books Formerly Owned By Famous Writers, Presentation Copies, Manuscripts and Drawings Collected and Described by Harry B. Smith. 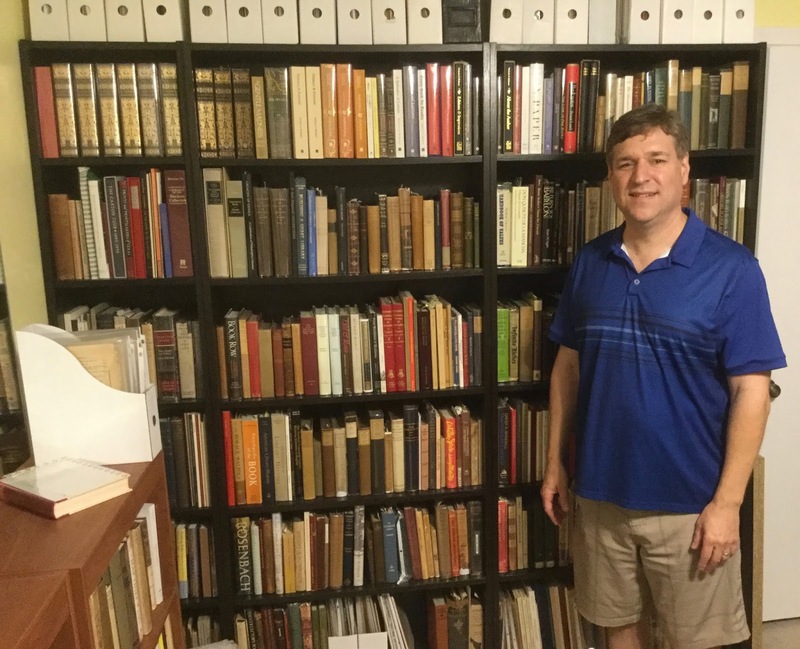 Kurt Zimmernan's library is the American Book Collecting equivalent of Harry B. Smith's Sentimental Library. 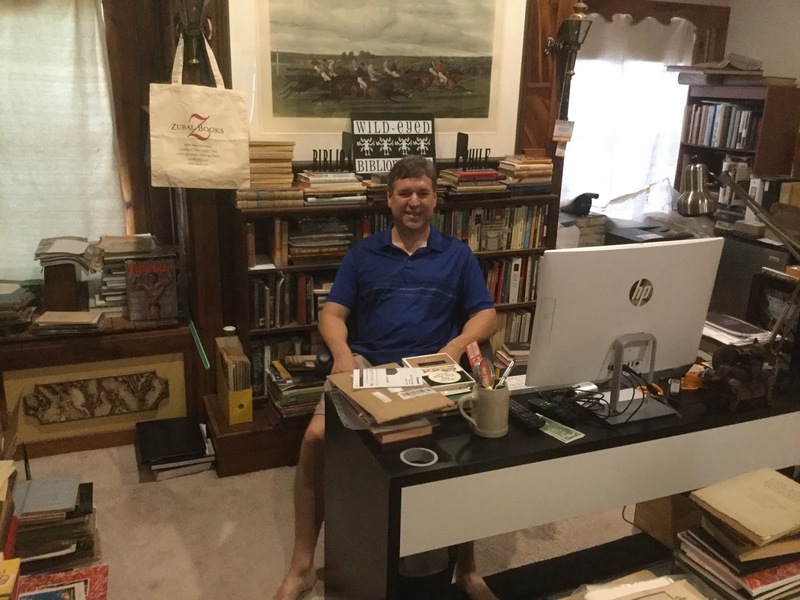 Everybody who was anybody in American Book Collecting past and present appears to be represented in Kurt's library. I can't think of any bibliophile whose books I didn't see in my brief ninety-minute tour of Kurt's Library. I saw books inscribed to bibliophiles whose names to this day are still sacred in the book world. I saw multiple copies of books each formerly owned by bibliophiles whose names I immediately recognized. Stunning would be the word that best describes Kurt Zimmerman's library. 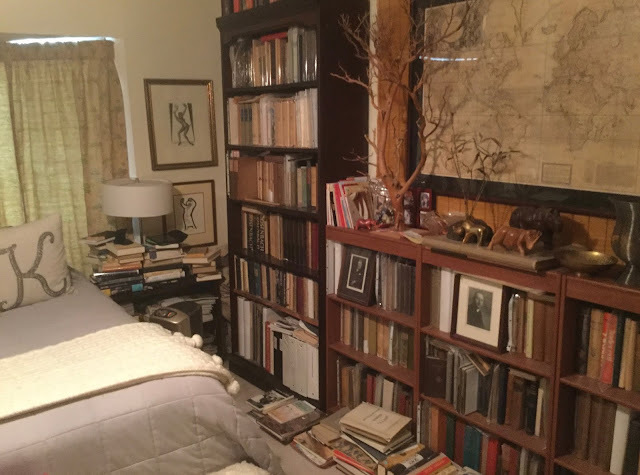 Kurt has books in every room of his house, including the master bedroom! Correction! Kurt does not have books in the bathrooms; but he says he's working on it. And Kurt's wife Nicole has a massive bookcase full of architecture books in the living room. Here is Kurt at his desk. Fifteen years ago Kurt and I used to bid against each other for choice association copies on eBay. And behind his desk Kurt would say, "Who the hell is MoiBibliomaniac?" Meanwhile in Florida I would say, "Who the hell is Zbooks?" 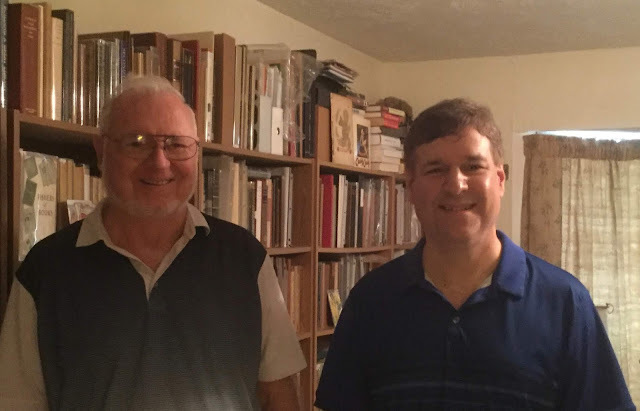 I have suggested to Kurt that he actively look for a publisher to publish a catalogue of his library. His library is that good! I have purposely refrained from identifying any of the former owners of his association copies. I want readers of his catalogue to be able to savor the moments of seeing the treasures that Kurt has collected firsthand. Kurt doesn't think he'll be ready to do a formal catalogue for several years to come. And even then he'd like to do a privately printed edition much like John Payne's recent Great Catalogues of Master Booksellers. I for one can't wait. Ninety minutes wasn't enough! It is a custom to give a book to the bibliophile whose library you are visiting. I, however, was temporarily at a loss to find an appropriate book to give to Kurt on such short notice. But I did find an appropriate book for the young visitors to his library to read. And I inscribed it to Kurt to commemorate the occasion of my visit to his library. 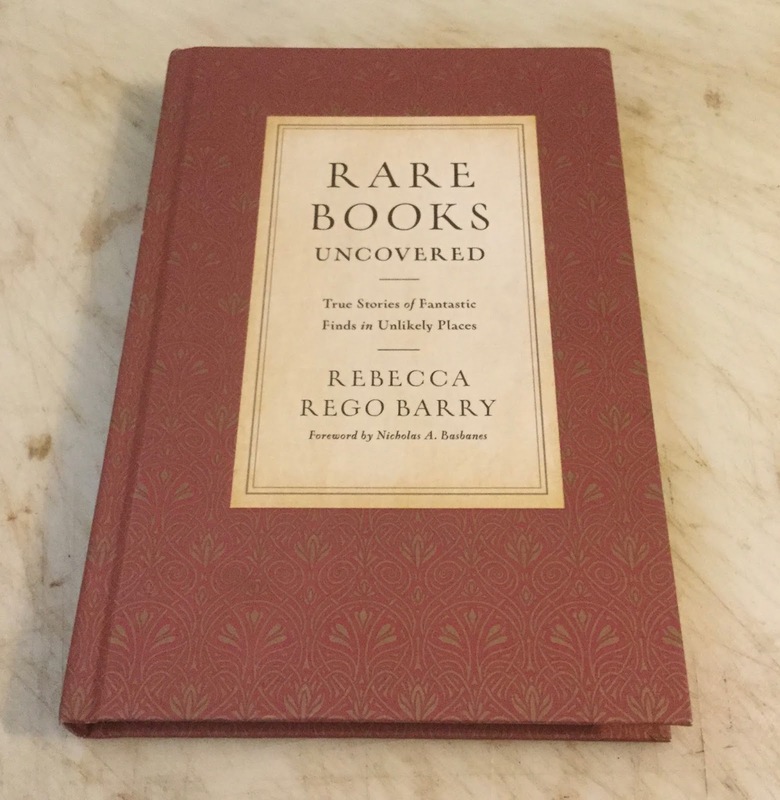 Both Kurt and I have stories that Rebecca Rego Barry included in Rare Books Uncovered. 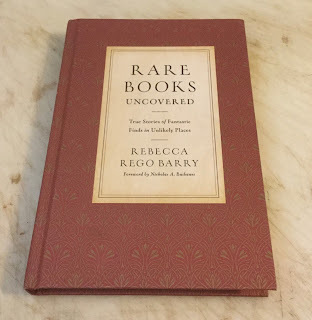 And Kurt surprised me with an inscribed copy of Rebecca's book as a memento of my visit to his library. Update: Sep 11, 2018. Kurt and his wife Nicole are currently moving to another house several miles away. They have moved 75 boxes of books so far, with another 260 boxes of books to go. I'll just have to see what his new library looks like the next time I go to Texas, at least a year from now. Kurt should by done unpacking his books by then.